If you're lucky, you'll see her calf too. They're born in late spring. She waded through the shallows, taking no notice of my son and me. she reminded me of a water bug. and then vanished into the woods. Mom followed, spooking a deer on the bank. The deer passed right by us, more scared of moose than humans. Mom seemed majestic with her long, splashy stride. There is something gloriously prehistoric about these huge beasts. 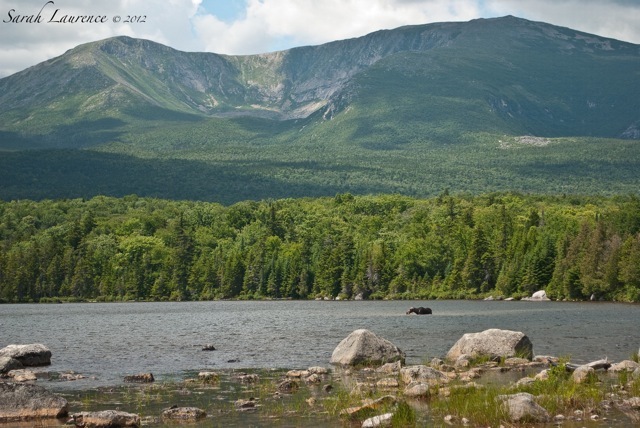 This is the wilderness that calls me home to Maine. I'm taking next week off from blogging to catch up with my extended family. I can't believe you have this natural wealth on your doorstep, so to speak. I enjoyed your photos and the narrative they conveyed. Plenty of sunshine, too, I noticed. Many thanks. Those are some awesome pics of nature, Sarah. Now that's definitely not something you get to see everyday! It must have been difficult to stay perfectly still for so long. 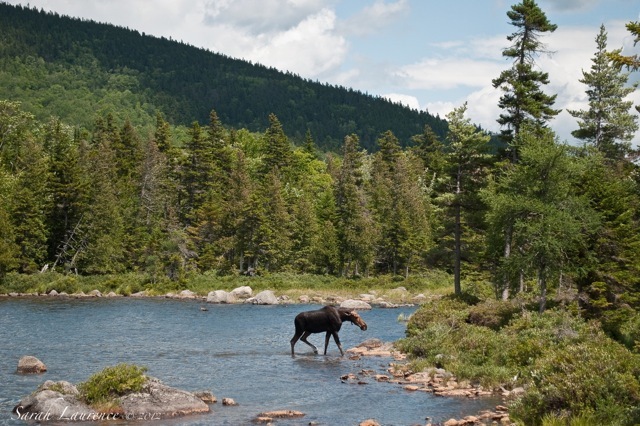 Do moose have a more keen sense of smell or sight? 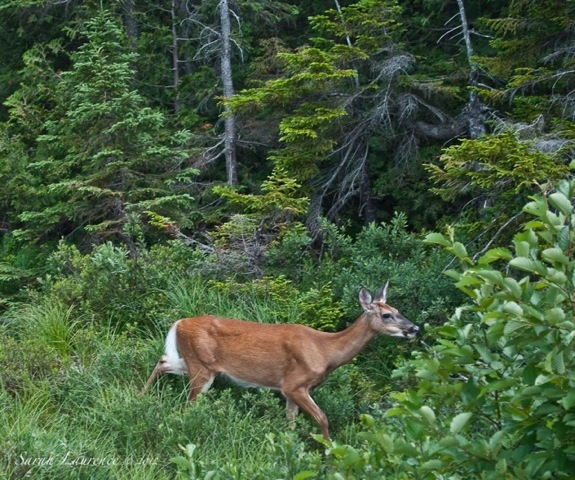 Wonderful wildlife tale through your stunning photography Sarah! Fabulous!! You make me long to visit there. Thank you for sharing this amazing encounter! Enjoy your family. You were so fortunate to have this experience. Thanks so much for sharing the photos! How fortunate y'all were to have such a magnificent encounter! Your description and photos made me feel as if I was there to experience them with you. I'm so impressed.... have never ever seen a moose except maybe in cartoons. Do have a most peaceful August vacation. Great photos, Sarah, it must have been an impressive experience. Weren't you afraid that the adult moose might attack you? 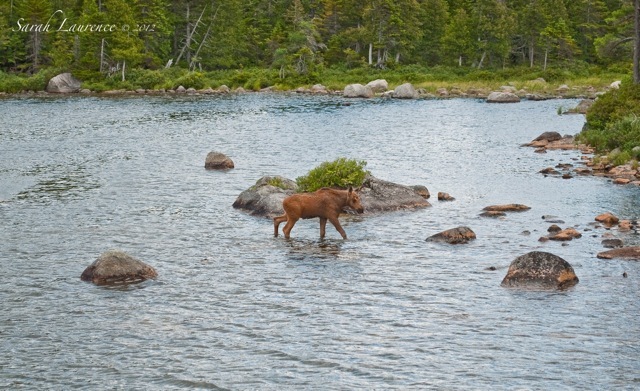 these are superb shots, sarah - particularly the close up of the moose calf and deer. how fabulous to be in proximity to such natural beauty. 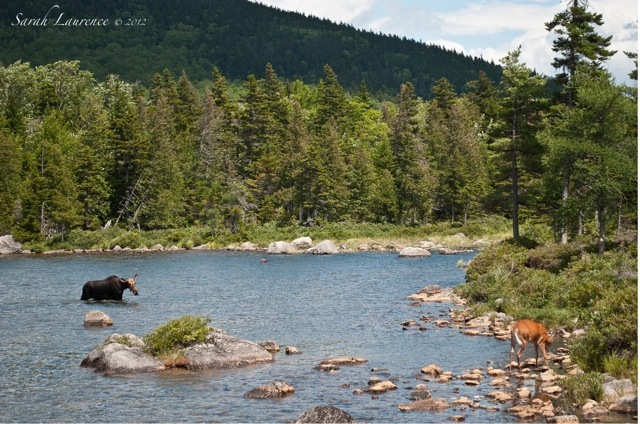 W2W, the Baxter moose are used to people watching them and they are too big to be afraid of anything. This park population is not hunted. We were standing on a viewing rock, at the end of a wooden walkway to prevent marsh erosion. I did keep still so as not to scare them. Petra, moose aren’t usually aggressive, except maybe during rutting season, but I wouldn’t get between a mother and her baby. I was a little worried on our first night when in the woods we passed within 10 feet of a moose and a much smaller calf. They ignored us. My son finds them rather bovine. 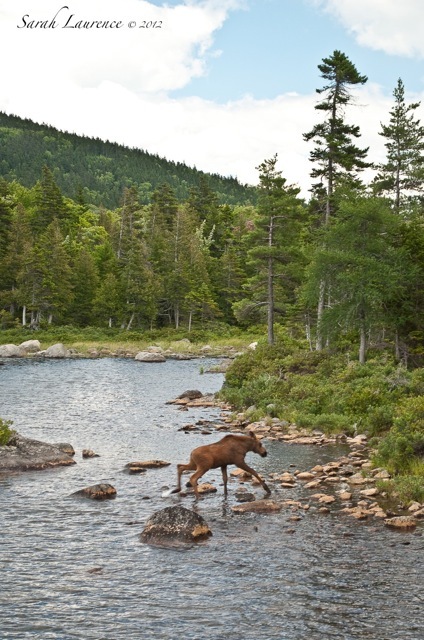 The only time moose pose a real danger to humans is when they wander into the road. A deer will bounce off a fender, but a moose is tall enough to go through the windshield and heavy enough to total a car. How special for you two. 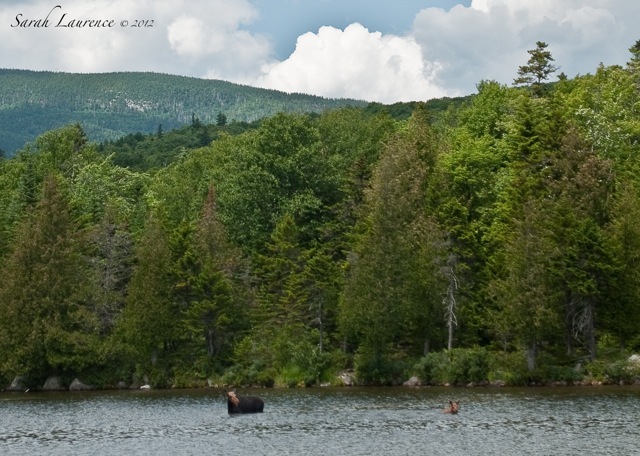 I have been fortunate enough to see a couple of wild moose sightings, and they remind me of half deer, half draft horse. 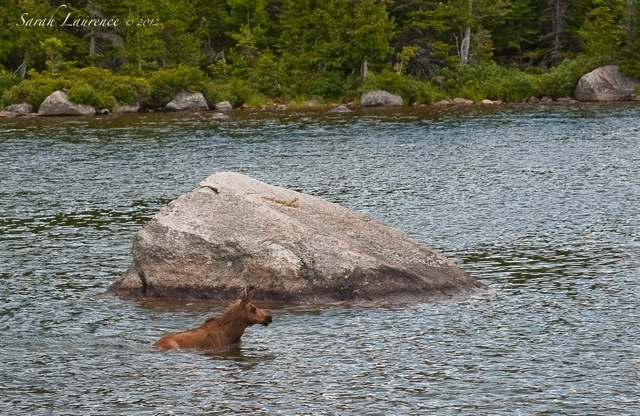 Troutbirder, I’m so sorry about your moose. 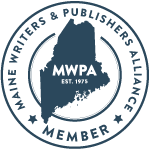 I hope that doesn’t spread to Maine. 5ref, thank you and welcome to my blog! I enjoyed your haiku. 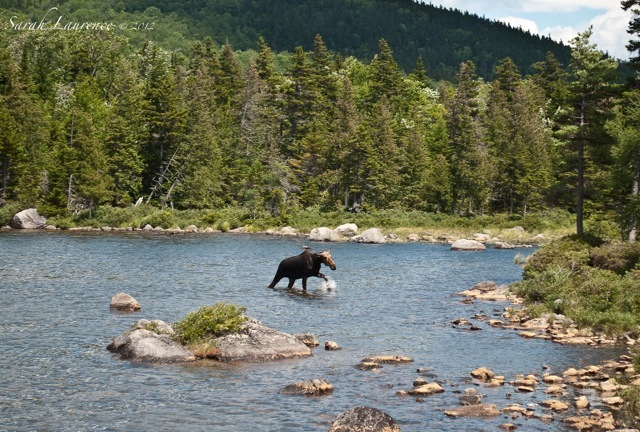 Lucky moose, to be living in such surroundings! What an amazing series of nature photos! They are so refreshing! Oh I've never seen a moose before. The sixth photo is awesome. Have a good time with your family!! I've just read your recent posts. I traveled for a while. A moose! Now that's something we don't see around here. What a thrilling experience this must have been! Great photos of your encounter. 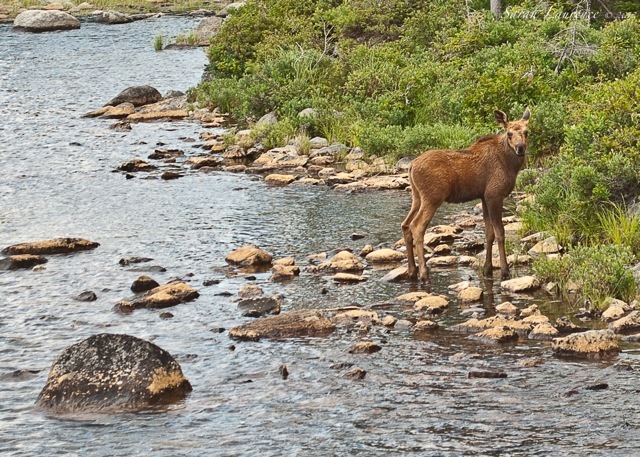 To know this is how a mother moose will have followed its calf since time immemorial is to know we're connected in a deep way to our past the way it always was, and will hopefully always remain. Continuity, the thread that binds us to our heritage. Always uplifting.